If you are an individual who is seeking a party bus in Clarkston, then your search has finally come to an end. Here at Rockstarz Limousine and Party Bus, we specialize in not only providing our clients with a wonderful experience, but also in offering the perfect location for your party no matter the occasion. To rent a party bus, you will have a number of concerns that have to be addressed with one of those issues being the number of guests that you are able to invite along. However, thanks to the way in which we have arranged the layout of our party bus, that is no longer an issue. As a result, you are able to invite more guests than ever before to help you to party the night away. 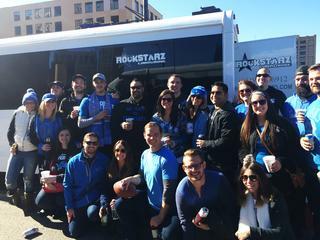 Our Clarkston party bus rental service will also leave you and your guests stunned with the way in which we are able to generate the ideal atmosphere for your party. Starting with the stereo sound system, your music will be blasted throughout the bus and then there is the laser light display to add some extra effects. Overall, you will feel as if you are in your very own private nightclub as you cruise around town. Previously, people have contacted us regarding our Clarkston party bus service to help them to celebrate a number of different occasions. From birthdays to anniversaries or even bachelor and bachelorette parties, we can help with anything that you need. Of course, you may also just be concerned with having a great time with some friends for no real reason, and even with that we can make sure that everyone has an amazing time. So, if you reside in Clarkston and are looking for a party bus, then give us a call here at Rockstarz Limousine and Party Bus. Alternatively, you can contact us via our website and a member of our team will be in touch to discuss your requirements.